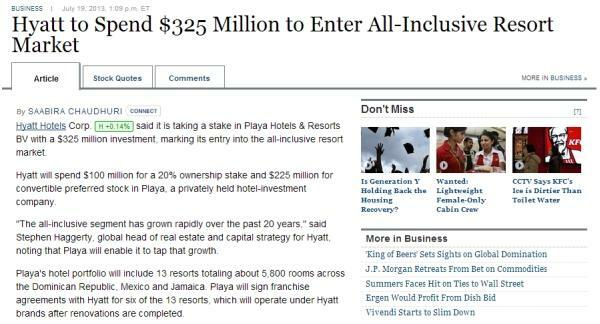 Hyatt has announced that they are making a $325 million investment to Playa Hotels & Resorts that operates hotels in the Caribbean and Mexico. You can read more about this on WSJ here and on Hyatt’s press release here. Playa will operate six of the properties under franchise agreement from Hyatt and under Hyatt brands once the renovations are completed. Two resorts in Mexico should be under the Hyatt flag later this year and four additional resorts are going to be introduced in 2014 and 2015 in Mexico, Jamaica, and the Dominican Republic. The Playa’s website seems to be out of date. It currently lists eleven resorts in Mexico and six in Dominican Republic. There are no resorts in Jamaica according to the website. There are six Barcelo branded resorts that have Premium-notation. These must be the likely ones to a Hyatt conversion? Personally, I am not a huge fan of all inclusive resorts, but there is definitely a market for them as well.